Our camera is broken. I can't think of a better, more sophisticated word for it, only "broken". 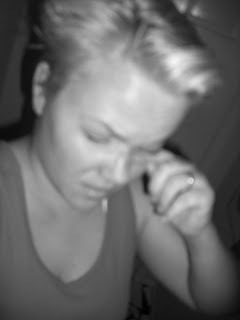 The pictures it takes now look like this blurry one of Me over here. I have found the camera I would like to replace it with but I have yet to convince my husband that we actually need a new camera. The hints I'm dropping are not working! And when I say hints I mean I'm telling him, "Hunny, the camera only takes blurry pictures now. Here's the camera I want. On the top 5 list of digital cameras with the best features for the best price, it is number 1 and it's only $149.99 at Target." The research has been conducted and I'm ready to BUY BUY BUY. The camera is the Canon A590 by the way. Since I can't take any new pictures and I want to keep blogging with pictures, here is a comparison of Raquel (as a newborn 4 years ago) and Maxine (currently 3 months old). As their mother, I can see and have experienced the differences in their features and personalities. It is astonishing the difference in behavior and playfulness the girls have exhibited. 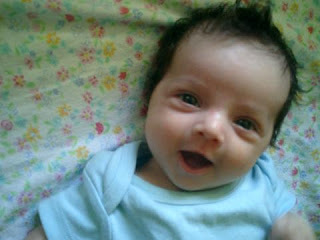 Raquel smiled at me, a real smile, when she was 12 days old. 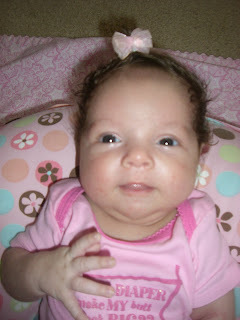 Maxine was 3 weeks old when she gave me her first real smile. I say real because fresh newborns smile a lot on accident (when they're sleeping, stretching, pooping) before they actually give you a smile that reflects the way they feel (about you) when they're looking at you and listening to you talk to them face to face. 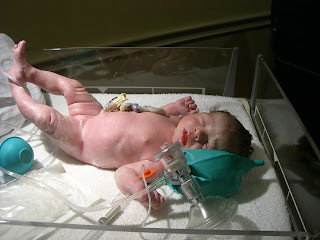 Raquel was one week overdue, meconium was in the sac (cause for concern), she weighed 6lbs 1.2oz and was 19 inches long. I was diabetic so there was lots of extra amniotic fluid. I think this is why the meconium did not affect her health at all (fluid to meconium ratio was high). 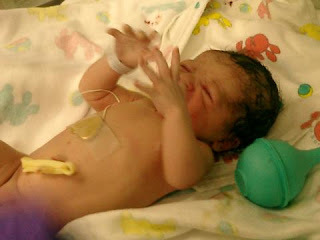 Maxine was 1 week early and weighed 6lbs 7oz and was 19 inches long. I was not diagnosed with gestational diabetes (tested at 8 months) but was glucose intolerant. 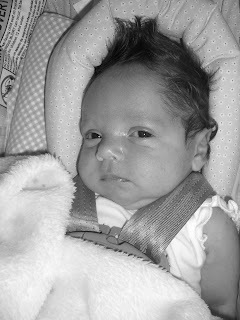 By the time I was 9 months along I did have some extra fluid so I think I probably was diabetic by then but undiagnosed. Both girls were healthy when born. Personality-wise, Raquel's was very apparent from birth (especially with 20/20 hindsight). She was very wide-eyed and calm when born and laying in the incubator. I wasn't allowed to hold her for the first hour due to the nurses watching her closely to check for any problems from the meconium. 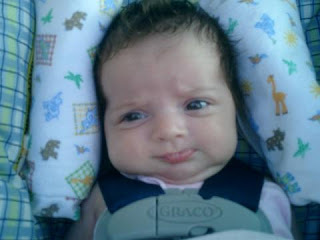 As a newborn she was very bright, coquetious, precocious and seemed to have a wonderful sense of humor. I didn't realize this until I experienced Maxine's more bland personality. I thought Raquel's intuitiveness, funny face competitions and ability to keep up with her parents' in-your-face humor (and even offer us comebacks!) was normal for all babies. Now that I've seen how laid-back Maxine is, it seems Raquel as a newborn was much more expressive and confident in herself. Maxine has taken a lot more time to offer us as much of herself. She has chosen to sit back and watch us first rather than have the devil-may-care attitude her older sister had/has. Nobody may care but her father and I but I think this is all extremely interesting. And Raquel's attitude hasn't changed, it has only increased in texture and richness. She is extremely willful, defiant, a true comedienne, dramatic, very happy, intelligent and well-spoken. And I'm really proud of her. they really do look a lot a like when you post pictures of the same age, but I can still see more of Jose in Maxine. I thought both girls smiled a lot and early judging from your pictures! I am excited to see Lucas' expressions and personality- he has been a lot more active lately and I hope this kidney thing doesn't aggitate him. only 12 weeks left! by the way, I think john said he wants to put together your gift when he gets home from work today- since you've given us permission! Cool, I think it would be a nice thing to have set up so everyone can see it at the babyshower, ya know, like, have it out with the rest of the gifts people bring. It will look good. I hate to ask such a silly question, but have you tried making sure the camera is not on macro setting? I only ask because two years ago, I took tons of pics here at work with my digital camera. All of them came out blurry. I was so sad because I have JUST bought the camera. So, I went home told G and he changed the macro setting. I wonder if Maxine is just going to be more calm or if it's just going to take Maxine more time to become just as colorful as Raquel is. I was thinking the same thing as prolifegirly. It wasn't until I saw the pictures side by side that I could really see Jose in Maxine. That picture of you at the top really sealed it. That could pass for Raquel! it's funny. i was just thinking about how much i used to work and be away from home when raquel was born. now with maxine, i'm feel like i'm able to injoy her more. both are so pretty. and very sweat girls. i'm a lucky dad. I like to see your comments, Bunni. Thanks for visiting.